For over 75 years the Ridley's have been providing the highest quality aged steaks available. All of our beef is USDA inspected and wet-aged to perfection for exceptional taste. We use no fillers, water, preservatives or chemicals in processing. We cut your steaks to order, unlike some that freeze the product months ahead of time. Our aging process is the culmination of many years of testing different methods to see which process results in the most tender and flavorful beef. We carefully age our steaks between 30 - 45 days. This does two things: first, it eliminates the moisture from the muscle creating a greater concentration of the beefy flavor and second, it allows the beef's natural enzymes to break down the tissue resulting in a natural tenderizing process. The result is an astonishingly more flavorful, tender steak! As noted below, our steaks are available with the natural taste or seasoned. 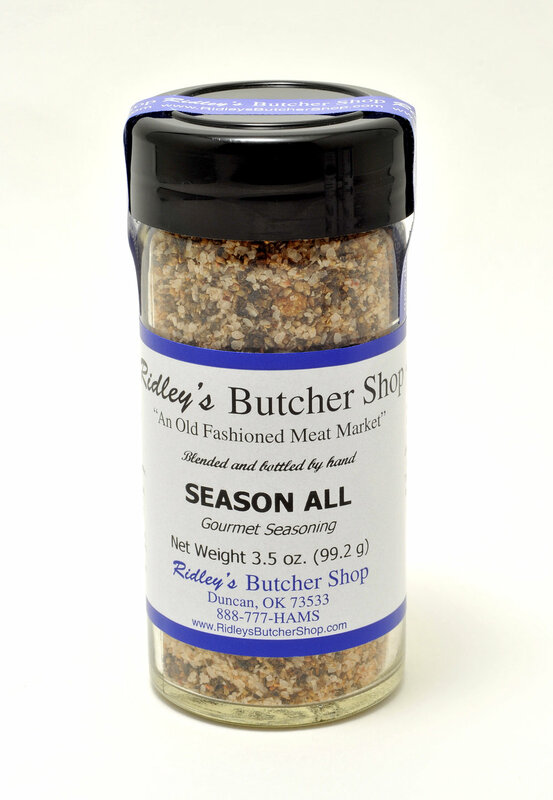 Our seasoning is a special blend of spices we have developed over the years by trial. The end result is an unbelievable enhancement that makes for the tastiest, most tender steak! Rib Eyes are our customer favorites! This is a tender choice with a visible amount of marbling. It is a boneless cut that is packed with flavor and juiciness. They are hand cut and vacuumed in freezer safe bags. The New Strip is also a boneless steak that is a bit leaner than the Rib Eye. It comes from the short loin. It has a natural flavor and is slightly more “coarse” than the Rib Eye. It is a sizable portion, so be hungry when you order this one! The Filet is also known as the Beef Tenderloin. It is a smaller portion but its tenderness cannot be matched. This comes from a muscle in a beef that is used very little so the natural tenderness will be apparent. The Filet is an outstanding selection for the most meticulous steak connoisseur. The Porterhouse is a T-bone steak which contains the Strip on one side and the Filet Mignon on the other side of the bone. It is a sizable portion that has the best of both worlds. Some believe the bone located through the center of the meat adds flavor that cannot be matched by a boneless steak. It is a delicious selection packed with juiciness and flavor added from the bone. For an added bonus, when you choose these for dinner Fido will have a bone to chew on after dinner! The sirloin is also a great steak. It is leaner than the others so it is a good choice for the heart-conscience consumer. Since it is leaner, it is also not quite as tender as the Filet, Rib Eye, or Porterhouse. It is a nice portion size and is also a nice choice for many recipes. The Top Sirloin can be grilled or sliced to be used in many dishes such as stir-fry, fajitas, Swiss steak, and K-bobs. Based on gas grill at approximately 400 degrees. To be used only as a suggestion, many variables can change cooking time such as outdoor temperature, wind, etc.